U.S. Military personnel first began receiving assistance in the 1600s in the form of healthcare and a small stipend of financial assistance. In 1917 Congress structured the foundation of today’s Veterans benefits. The benefits included disability compensation, insurance coverage, physical rehabilitation, and back to work rehabilitation training. By the 1920s, federal agencies were established to give Veterans better health insurance benefits, including their family members. The agencies included the National Home for Disabled Volunteer Soldiers, the Veterans Bureau, and the Interior Department’s Bureau of Pensions. A year later in 1921, Congress combined all the agencies together which also created beneficial hospitalization programs. A military Veteran serves in the Army, Navy, Air Force, Marines, and certain Coast Guard duties. No man left behind is the government’s goal for its Veterans especially in their quest for better physical and mental health care, as well as education. It is a law that all Veterans enrolled in any branch of the military must receive the Department of Veterans Affairs (VA’s) comprehensive “Medical Benefits Package.” Each health insurance for Veterans package includes specialty care services, preventive care support, and education, primary healthcare, diagnostic tests, inpatient/outpatient services, and certain dental treatments. During the past few years, the U.S. government has increased their efforts in providing the support that our military personnel needs. There is quality health insurance for Veterans, specialized programs for veterans, as well as coverage and benefits for dependents of veterans. The Department of Veterans Affairs (aka the GI Bill) provides health care services for Veteran’s, their family members, and dependents, especially under programs for veterans like “Family Member and Dependent Care Programs.” Veterans are generally aware of the benefits that are available to them, many of which are free to participate in through the VA and organizations like the Disabled American Veterans, Veterans of Foreign Wars, the American Legion and the Vietnam Veterans of America. The VA provides tools to help with health insurance for veterans with the highest quality of care. Many programs for Veterans and their dependents vary in requirements and varying in benefits by each U.S. state. The Veterans Administration Department continues to offer medical, educational, and financial support for spouses, certain parents and dependent children of disabled veterans. CHAMPVA is a leading health insurance benefits program where there are no premiums because it is covered by Medicare which is the primary carrier. In addition to Medicare, the primary CHAMPVA benefits are available for both veterans and family members who are also offered services through TRICARE and Medicaid. Spouses and dependents whose veteran family member is totally disabled qualify for health insurance from the Civilian Health and Medical Program. At the end of the age of 18, a child’s eligibility stops. There are exceptions for that child which includes their attendance in a school. While still in school a dependent’s eligibility then extends to age 23. A spouses eligibility stops if there is a divorce or if they get remarried after the Veteran husband has passed away and before the spouse turns 55. The Veterans Administration Department offers individuals who care for Veterans in the privacy of their homes and outside the home. The VA believes that if people have the heart to help our men and women who have given their all to help protect our rights, then they should be compensated and thanked. Programs are available to support caregivers of Veterans. Whatever supplies that Veteran caregivers require, the VA will help supply such as personal hygiene supplies. The VA provides dental care for Veterans if they meet certain qualifications. Some Vets can receive extensive dental care while others are eligible for minor services like cleaning, tooth extractions, and fillings. Even though you are an adult now, if you were the child of a mother who serviced in the military during the Vietnam War (1961 – 1975), you qualify for full-service health care and in some cases financial compensation. To qualify, the adult children of Vietnamese women and Vietnamese-stationed military personnel can receive health care benefits who have suffered unexplained health conditions. Their health conditions over the years may possibly be traced back to being a fetus who was born with health issues as a result of toxic sprays used during the War. Dependents of Veterans are eligible for educational training if their military family member is disabled or if their family member died while actively serving. Dependents can receive 3+ years of educational benefits including trade schools, at-home educational classes or on-the-job training. Medical Rehabilitation- medical services involves blind or poor vision treatment. Prescription assistance and health education for excessive weight gain for the prevention of illnesses and diseases. Substance abuse treatment and smoke cessation education. Homelessness- the VA’s goal is to end Veterans not having a place to lay their heads. President Obama signed the Employment of Veterans Order which helps Veterans find the right employment opportunities for them. The U.S. Government does not forget the military men and women who are part of the elder population. Benefits include help for Veterans with chronic illnesses, who are disabled, aging aches and pains, injuries, and life impeding diseases. Uncle Sam helps pay for long-term care programs, nursing homes or healthcare residential facilities, home care, fitness programs, and medical, as well as advanced care planning. Veteran’s carry life insurance under the Family Servicemember’s Group Life Insurance policy. Spouses can convert their spousal coverage under this policy to a traditional style individual plan with a private insurance company. They must accomplish this chance within 4 months of the Veterans separation from the military. Spouse’s do not any proof of health concerns. Under the Family Servicemember’s Group Life Insurance plan, beneficiaries can receive tax-free death benefits. As previously mentioned the largest coverage plans that qualify for health insurance for Veterans and their dependents is TRICARE. 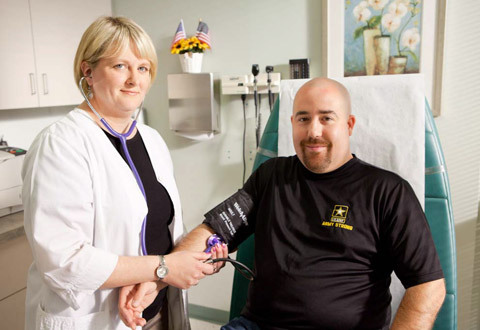 TRICARE is sponsored through the Department of Defense and their health insurance program. It is eligible to use by military personnel, certain family members, retired service personnel, and survivors of military members. Family members of Veterans including their children can receive TRICARE benefits aside from the Affordable Care Act. The Affordable Care Act is the health care insurance law which does not affect any VA health care benefits or out-of-pocket costs. You can continue to receive VA health care. Coverage for dependents of Veterans under a TRICARE plan (minimum and premiums plans) receives special health care services that include dental care and prescription medications. As a day-to-day worker, we don’t normally think about our health care insurance coverage and the same is true for military personnel. After a military man and/or women retirees, they are given documents identifying the basic health care coverage to meet their needs and information on coverage for dependents of Veterans. However, there are many additional services that are available for Veterans including free medical benefits that can be discovered on many government websites. As a retired Veteran you are eligible for loans, pension plans, readjustment counseling, discounts and lots more.